Does your team have big ideas, but no time to explore them? Or maybe your business has a challenge but you haven’t had time to develop a solution yet? 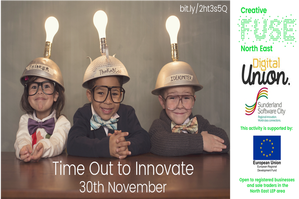 Sunderland Software City is hosting an innovation day on 30th November on behalf of Creative Fuse and Newcastle University. We invite you to take some time out to join like-minded tech and digital companies, to explore new ideas and exciting solutions. You’ll chat, hack and develop your ideas in a group environment. There will also be the opportunity to share your ideas and receive support from experts at Newcastle University.